Is it wrong for me to have a favorite Lady? I’m not admitting it or anything, but if I did have a favorite and if I told you who it is, you’d probably be surprised because we don’t talk about her much. Some of the Ladies are hambones and always in the middle of the action and some of them are not. Sally isn’t a flashy girl, but she is pure, sweet and true and we’re crazy about her. It took me a while to figure her out when she first came – I wasn’t familiar with the ways of cows and she was a little different from the others. Neither a leader or a follower, Sally holds her own without being mean or bullying. Sally is a little shy and still doesn’t like direct eye contact. You have to be paying attention to understand that when she comes close and looks at your feet, she wants you to spend time with her. She really likes being around us and loves to be talked to and groomed. There’s never been a been a kinder, more devoted mother than Sally, two-legged or four. 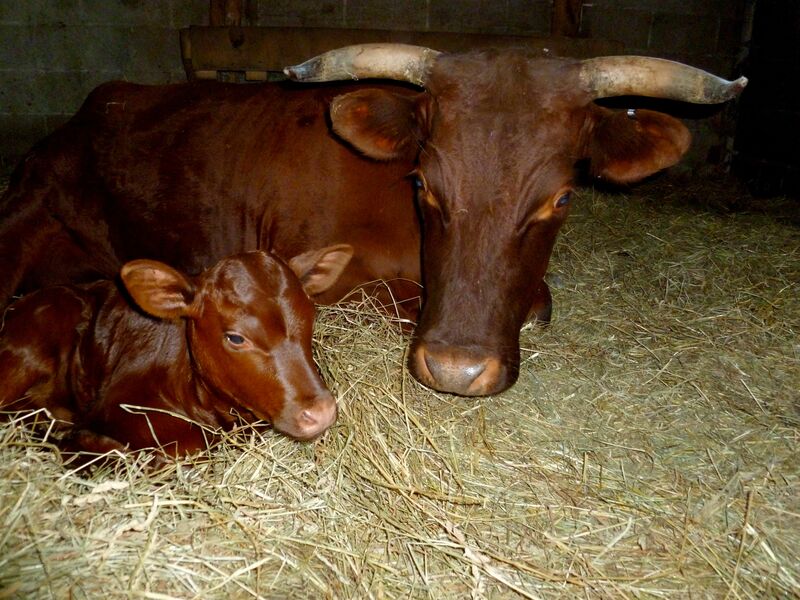 Last year, Sally had her first calf, a heifer named Saralee. Saralee is a real charmer and a sweet girl herself. Saralee was born in August during the hottest, most miserable weather of the summer. True to form, this year, Sally was again the last Lady to deliver and while it was in July this time, it was still the hottest, most miserable weather of the summer. The poor girl can’t get a break! But Sally never gets grumpy or complains. This year, Sally had a boy. He’s peppy, chubby and really, really shiny. 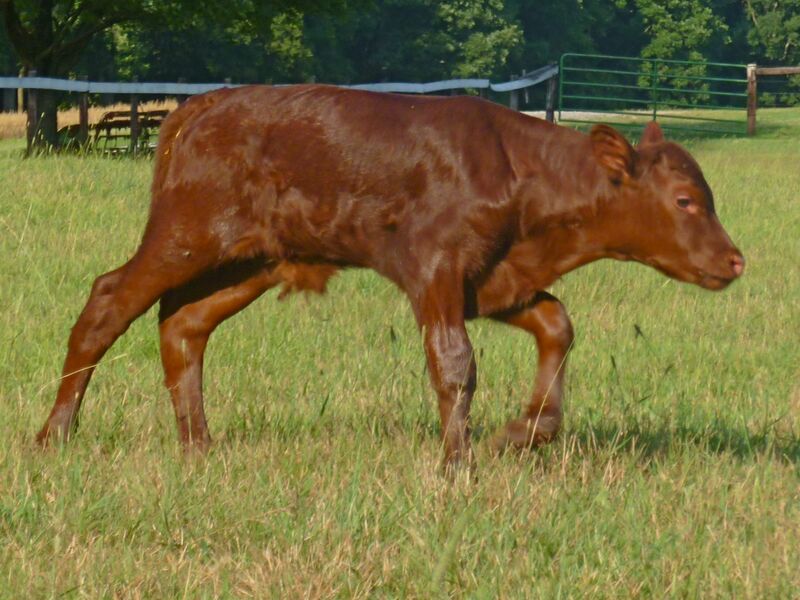 He has an especially beautiful coat just like his dad, Rocco, had as a calf. We sort of joke that Rocco was super-calf racing around as soon as he hit the ground (I say sort of because it was no joke – Rocco was super charged). It appears this little fellow is a chip off the old block. 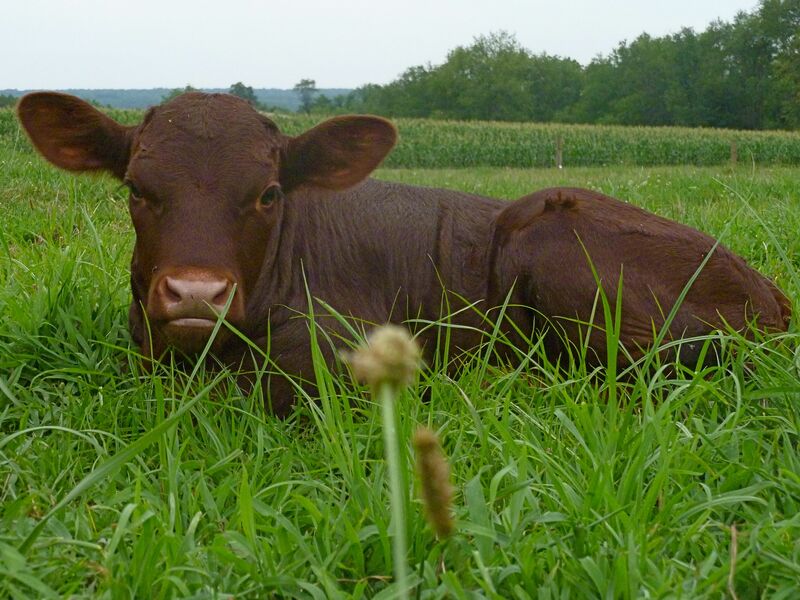 He kept everyone on edge his first day because he kept slipping out of the pasture and running off. Poor Sally was bawling and running around too. What could I do? A little house arrest was in order, so back to the barn for a few days of bonding. He needed a little time for Sally to teach him the ropes before returning to the great outdoors. Sally was happy to have a few days of room service and we got the opportunity to get to know this sassy new kid better. Happy to say, the plan was a success and Sally and Sammy have returned to their pasture. Sammy’s a busy fellow learning all about running, bucking and kicking and chatting up Ladies. And respecting boundaries. This is such a sweet post, I love reading about Sally and Sammy’s personalities. I never really thought about cows having personalities until I watched an interview with Portia de Rossi and she described watching cows in her barn (who didn’t know she was there) as they met new cows, and how they greeted each other, and how there was understanding and emotion between them. Sally and Sammy really drive the point home, and I found their story very touching. And, they’re adorable! Thanks Janae, glad you enjoyed my cows. I’ll have to look up that interview – I didn’t know Portia and Ellen were farmers. They are multi-talented women for sure. Cows do form lasting friendships. The babies will bond with each other early and remain friends (or not) for the rest of their lives if given a chance.